I had every intention of having a new recipe ready this week, but that did not happen. Work has been crazy, on call has been crazy, we’re still eating through leftovers, and time has been an issue. Oh well! 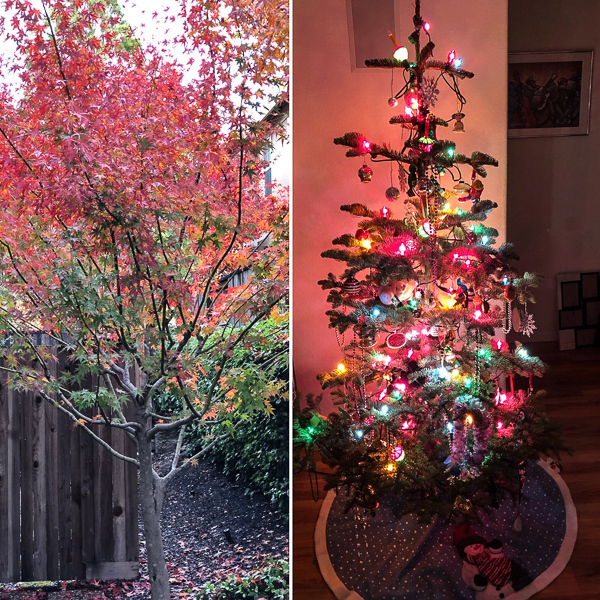 The fall trees are gorgeous here and we finished our Christmas tree. Both of our chihuahuas are picky eaters who do not like me to get near their teeth. Has anyone ever successfully brushed a chihuahua’s teeth? Miko is coming up on another teeth cleaning and I hate putting them through that! And I’m worried that maybe he’s too old for that procedure now and trying more home solutions to take care of his teeth. I found these C.E.T. VeggieDent treats for small dogs to try. And he is a fan so far! 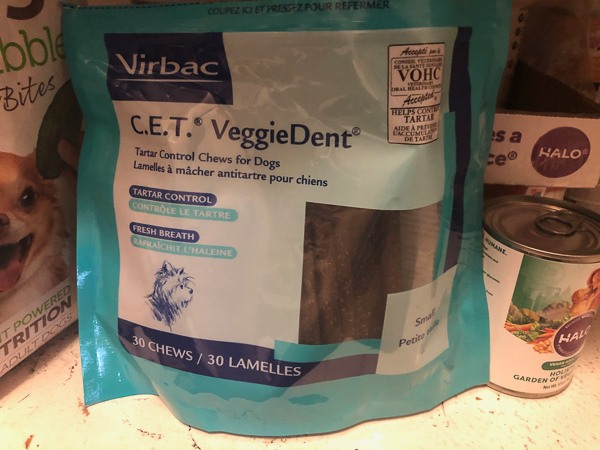 They’re biggish chewy veggie strips that keep him busy and when he’s not chewing, he loves to wander around the house looking to a place to hide it from Leela. Hopefully it helps his teeth, we’ll see when I get through this package. Eats have been interesting and simple this week, the last two nights I’ve been a bit scatterbrained taking work call interruptions and just keeping it easy. I made simple air fried veggie egg rolls stuffed with sauteed Beyond Meat “Chicken” strips, shredded cabbage, and carrots seasoned with tamari and dipped in a sweet chili sauce. Not exactly beautiful perfection, but delicious. 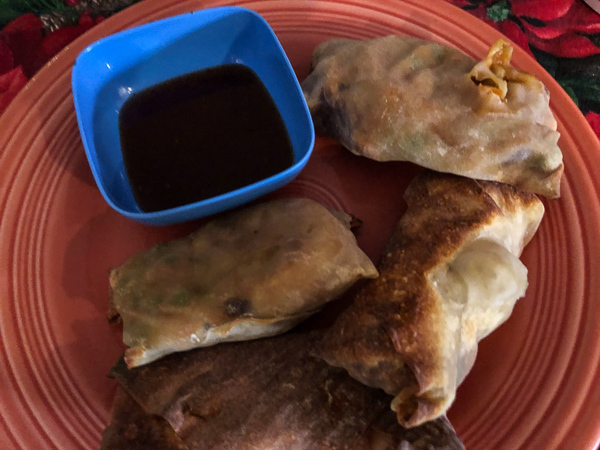 We also have a lot of Daiya Shreds in the fridge from a Grocery Outlet score, so I stuffed an egg roll wrapper with Daiya Pepperjack Shreds and air fried it with the veggie rolls and it was deliciously gooey with a crunchy outside! 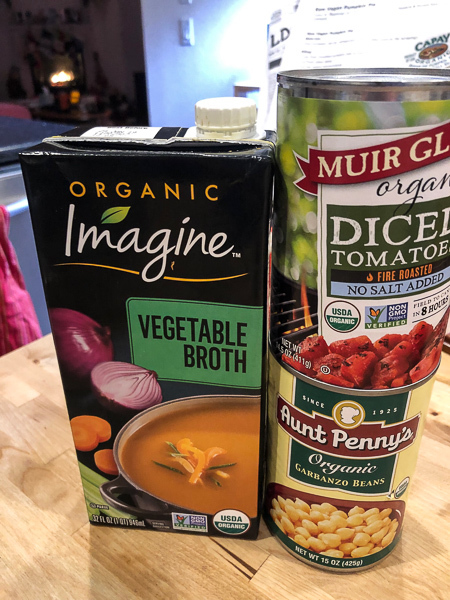 Not health food, but a fun comfort splurge. 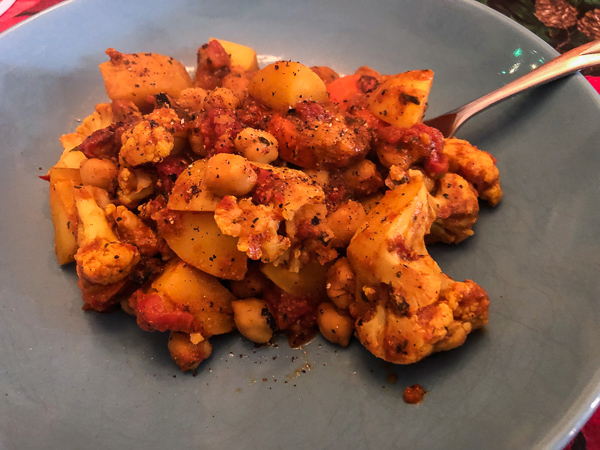 I also stir fried veggies and chickpeas with fire roasted canned tomatoes, veggie broth, and curry seasonings for a simple one pot meal. It came out delicious with a kicky flavor and very filling without oil. And I love keeping vegan pasta sauces in the pantry and load up every time Sprouts has a sale. 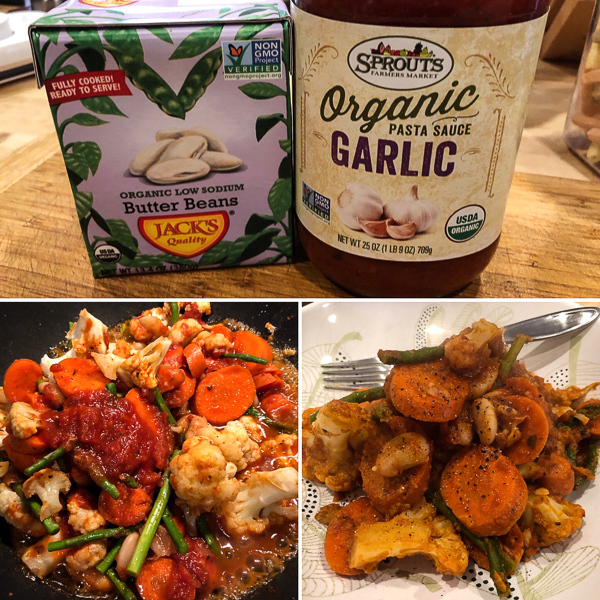 Tonight I simmered butter beans with asparagus and other veggies in it for a hearty, but light marinara stir fry. Tasty and the leftovers will be perfect for an easy work lunch tomorrow. But whew, I am feeling a little fried and scattered this week – the holiday madness seems to be starting early. But simple and hearty dishes like these are perfect for stressful and long days. Gizmo (13) and Coco (4) had their teeth cleaned on Tuesday. Poor Gizmo had 9 teeth extracted!! Coco didn’t have any removed. NO, they will not, and never have, let me clean their teeth. I’ve tried so many times with so many different brushes. 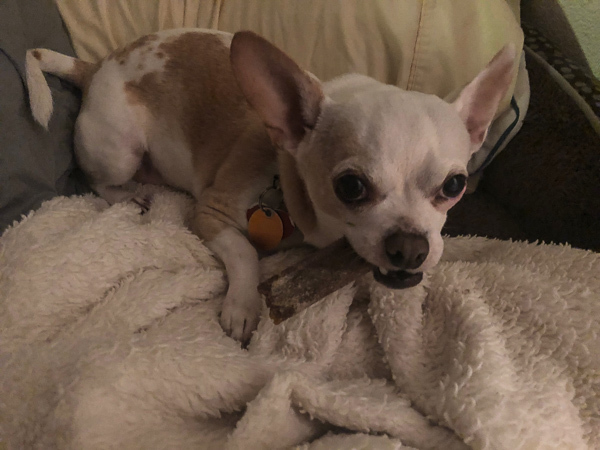 My vet and his technician, who has chihuahuas, said that even if they let me brush their teeth, the reality is that they would still have teeth removed as they age. It’s hard to get to the back of the teeth and the teeth in the back of their mouths. The good news is that Gizmo doesn’t seem to be any worse off than he was before his cleaning. He’s eating fine and his usual sweet self. Ugh, I’m worried mine will need teeth pulled too, such a challenge. I have a few brush kits too and no luck! That’s good about his teeth, Leela will probably need some removed. Aw, I love your tree, it’s so cheerful! I’m also worried about Luka’s teeth since he hates the whole concept of brushing. I’ll check out those chews right now. Yes, seems to be a trend with small dogs and I have yet to find a brushing kit that works! Haha, I use the VeggieDent’s, too. My dog is iffy about them. My last dog cleaning teeth bill was $800 and apparently that was a deal! Yikes. The only thing worse than trying to clean a small dogs teeth is cutting a small dogs nails. I mean, we are both in tears by the end of it! Yes, they’re not fan of nail clipping either – so much drama and I need to get that taken care of at the vet too!